Able Moving & Storage owns and operates 4 large warehouses located at 8050 Wellingford Drive in Manassas, Virginia. The warehouses were built specifically for storing office furniture, household goods, and equipment for residents of Tysons VA. Goods are stored in wooden storage vaults or on steel racking. Proper padding and shrink wrapping are applied to all of your goods as appropriate, depending on whether the goods are placed in vaults or on racks. 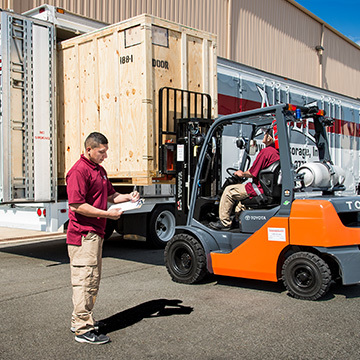 Able Moving’s secure facilities are fully protected by secure fencing, monitored by 24-hour video surveillance. Our secure, state-of-the-art warehouses feature the very latest in fire and theft protection as well as trained, full-time staff. Commercial Storage for Tysons VA doesn’t get much better. Planning a winning strategy and an accurate relocation budget may be a daunting task. Able Office Moving breaks this down into the manageable tasks outlined below, and assists with each step in the process. We provide only the best in Tysons VA and surrounding areas.